-Will Claye missed the team by one centimeter. -Jarrion Lawson bounced back and forth between the runway and the 100m semifinals. And he qualified for the final. -Marquis Dendy got hurt on the runway when he was in second place and had to pass his final two jumps. -Jeff Henderson exceeded the previous world lead twice, though both were wind-aided. -Four men jumped 8.40m (Henderson, Lawson, Claye, Dendy). -Lawson finished second, but got the world lead. I wasn’t around for the 1991 World Championships, when Carl Lewis and Mike Powell battled each other for the world record in Tokyo. That had higher stakes and better marks at the top, but the depth on Sunday was unprecedented, even considering the wind-aided marks. 8.25m was only good enough for seventh. The leaderboard was musical chairs with an added dramatic flair of Claye’s need for the Olympic standard and Dendy’s injury. Watch the last 150 meters and tell me what happened…..
.@fastk8 wins the women’s 800M Final in 1:59.10! Here’s the theory I’m working on. Brenda Martinez clipped Ajee Wilson’s heel (Wilson said she felt contact right before she heard the crowd react to the fall). This caused Martinez to stumble and slow. Alysia Montano then collided with Martinez from behind sending Montano to the ground and throwing Martinez out to lane 3. If you have another order of events of what happened, there is a very good chance you could also be correct. Here is another one. After the fall, Kate Grace caught Wilson for the surprise win. Wilson held on for second and Chrishuna Williams finished .04 ahead of Molly Ludlow for the final spot. Martinez has another chance to qualify for the Olympics in the 1500m. If she makes the 1500m team it may increase her odds of a medal in Rio, considering she wouldn’t have to race Caster Semenya (assuming Semenya doesn’t run the 1500, of course). For Montano, this is her only event in the Trials. The crowd tried to cheer her in after the fall, but every few strides she dropped to her knees and sobbed. The finality of a last opportunity showed with every collapse to the track over the last 100 meters. After the race, Montano didn’t hold back in the mixed zone. Not on anyone involved with the fall, but on the IAAF who she described as a “corrupt institution” because of their handling of doping in the sport. This was a close decision between Okolo and long jumper Marquis Goodwin. Okolo entered the meet off an NCAA championship and held the second fastest time of the year. The way she was running relative to the rest of the Americans meant a victory was more likely than finishing outside of the top three at the Trials. Her performance in the semi only confirmed that — she won heat two by .8 seconds. Then, it came time for the final and she was never a factor. She finished sixth in 50.39, .02 slower than the semifinal. End of a long season? Misjudging the effort from the semis to the final? Probably both of those. Now she will have to settle for being part of the U.S.’s incredibly deep relay pool in the 4 x 400 where a sub 50 second quarter miler could be on the bench. 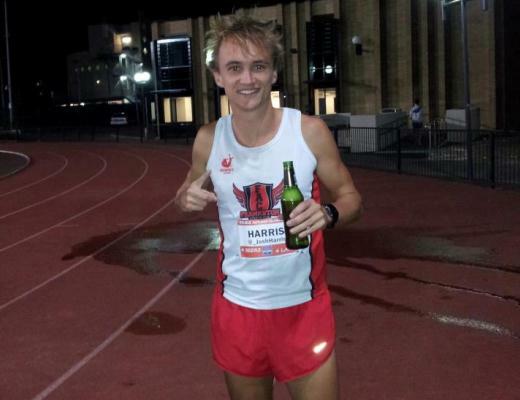 In order to maximize the benefits of altitude, Ryan Hill arrived the day before his 5000m prelim on Monday from the Bowerman Track Club’s high elevation training base in Park City, Utah. He won’t stay in Eugene long. “Jerry is obsessed with the effects of altitude,” Hill said of his coach Jerry Schumacher. Hill will take a direct flight to Park City on Tuesday, stay there for three nights before returning on Friday to prepare for Saturday’s final. Best English Gardner quote: …….. The top two finishers in the women’s high jump were a 32-year-old mother of three and the 18-year-old daughter of a former NFL quarterback and current minister. Claiming the final spot was Inika McPherson. — a 29-year-old woman from Houston, Texas with a blue mohawk, over 30 tattoos and who, until nine weeks ago, was suspended from track and field for testing positive for cocaine. McPherson entered Sunday’s final without the Olympic standard, the by-product of a 21-month ban that took her out of competition from July 2014 until late April of this year. “April 26th,” her coach Patrick Pyle can recall the reinstatement date without a pause. He also remembers the moment he found out McPherson tested positive, just after she’d won the U.S. Outdoor Championship in 2014. “It’s a punch in the face. I’d never been exposed to anything like that. It’s embarrassing, it’s a let down,” Pyle said. After the U.S. title and the personal best, Pyle says there were sponsorship possibilities. More importantly, a chance to build her resume and become the best high jumper in the United States. All of that was erased when USADA said she’d failed an in-competition drug test. “When you add up what she lost, it’s a lot,” Pyle said. What didn’t go away was McPherson’s talent. At 5’4 she’s the shortest woman to ever jump two meters. Pyle compares her to Spud Webb, the 5’7 basketball player who won the NBA slam dunk contest in 1986. But, in Pyle’s words, McPherson’s pre-suspension lifestyle wasn’t conducive to reaching her potential. “It was great training before the suspension, but there were a lot of holes. There were a lot of times when I would received text messages that say, ‘Coach I can’t make it today,’” Pyle said. “I wasn’t surrounding myself with the right group of people. I wasn’t in the right frame of mind,” McPherson said. But during the suspension, the missed sessions went away and instead McPherson had consistent training –the best of her career. “It was never a doubt in my mind that I wouldn’t keep going, it was just how was I going to keep going,” McPherson said. With such a short window between when the suspension lifted and when the Olympic Trials began, Pyle decided to compete at meets closer to home and forego heavy travel. That meant jumping in smaller competitions, ones that weren’t sanctioned by the USATF for qualification purposes. She’d exceeded the Olympic standard of 1.93m twice at all-comers meets at Rice University, but neither were accepted by the USATF (despite this, Pyle says the USATF’s stringent process for sanctioning a competition are “understandable and admirable”). This meant her task on Sunday was two-fold in order to become an Olympian — finished top three and clear 1.93m. The two favorites, Vashti Cunningham (who at 6’1 is nine inches taller than McPherson) and Chaunte Lowe both recorded no misses up to 1.93m. McPherson also was the only other jumper to make it to that height, but still need to clear 1.93m to make it on the Olympic team. She did it on her first attempt. Courtney Okolo certainly went slower when most go quicker in the finals, but her drop off was minimal compared with McQuay. 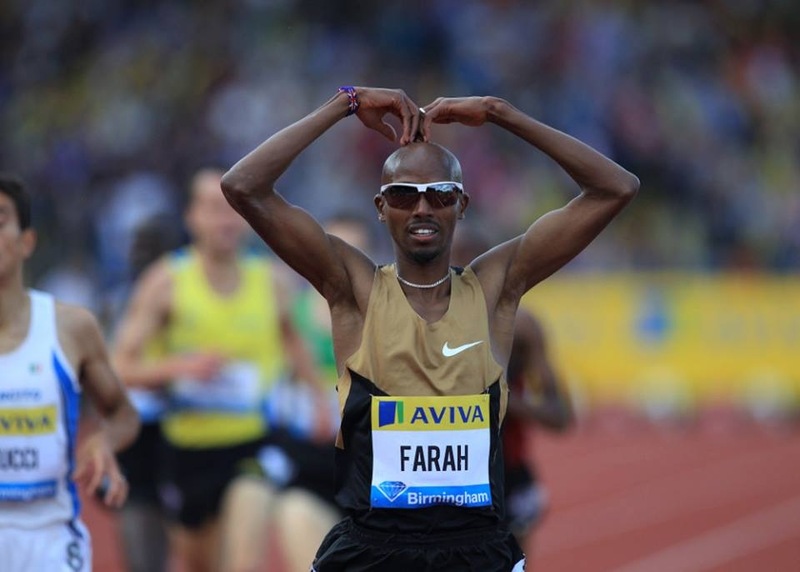 He slowed from 44.24 to 45.30 in the final of the men’s 400m where he finished fifth. The final qualifying spot went to David Verburg, who ran 44.82. Meaning McQuay could have slowed by over a half a second from the semi to the final and still made the team. His parting gift from Eugene is a personal best that I’m sure he’d gladly exchange for an Olympic berth. 10.78 gets third in the Olympic Trials. More specifically, a wind-legal 10.78 only gets third in the Olympic Trials. 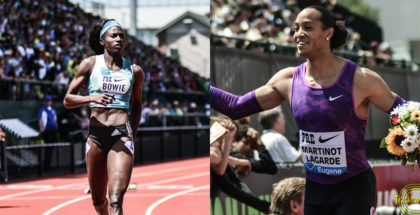 Entering the meet, Bowie was probably a slight favorite over English Gardner in the women’s 100m. After Bowie’s effortless victory and quick (though wind-aided) time in the semis, her chances of winning seemed even better. In the final, it took personal bests from Gardner and Tianna Bartoletta to drop her to third. 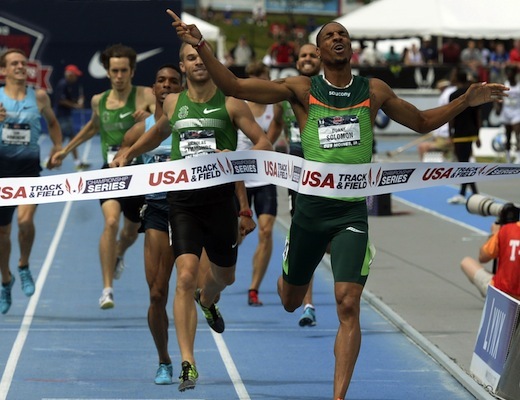 And it was the least dramatic third place finish for an Olympic Trials 100m possible. Those three broke away early and had separation on the field for the duration of the race. To be forever remembered as that thing that happened five minutes after the women’s 800m. Depending on how your view staggers, Felix was somewhere between 3rd and 6th coming off the final turn. Her close looked more like the finish of a 200m than a 400m as she went past the entire field and to a world leading time of 49.68.